serve. 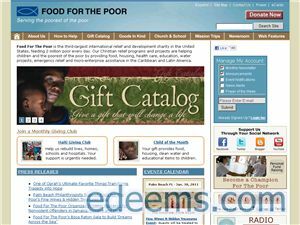 Food For The Poor raises funds and provides direct relief assistance to the poor, usually by purchasing specifically requested materials and distributing them through the churches and charity organizations already operating in areas of need. © 2019 Edeems, Inc. Patent Pending 2/861,305.